1. Don't plan a visit to Pench National Park during Monsoons. The park is closed from Mid-June to Mid-October and your visit may be a complete failure. 2. If you plan your visit with help of a tour operator, then generally you don't face such problems, as tour operators are aware of when the Pench National Park is closed and when it opens. But for those who plan their tip on their own should remember these details about the park. 3. Since the nearest town for which one can say is located near the Pench National park is Nagpur. 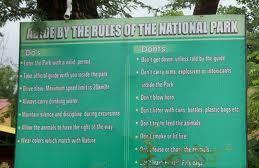 So visitors who wish to visit Pench National Park should consider Nagpur as their first choice. 4. Try going on a Jungle Safari in Pench during Mornings, which can definitely broaden the chances of spotting wild animals and herbivores including the mighty Tiger. 5. All the resorts which offer accommodation nearby Pench National park arrange for Jeep Safaris and Elephant Safaris. Hence it's ideal to suit yourselves with just one operator other than trying to make plans with many of them. 6. There are around 3 gates for the entrance to the Pench National Park. And hence it depends on from where you visit. The nearest and the most convenient Entry gate for Pench national park is the Turia Gate. 11. While coming through the Nagpur – Jabalpur Highway don't forget to look for the Pench National Park Sign Board on the highway which you may come across at Khawasa. Take that turn from Khawasa, which leads to through a Metalloid road to Pench National Park. 12. Last but not the least, if you really wish to spot a tiger in Pench National Park, opt for a Elephant Ride which definitely adds more chances for spotting a tiger. Kanha National Park lies close to Pench National Park and is around 120kms.